"You might not know how to sing or even whistle, but surely you're not going to sing badly, in playback"
The Portuguese Final was held on March 7th at the Teatro Maria Matos in Lisbon, hosted by Eládio Clímaco & Rita Ribeiro. The winning song was chosen by the votes of 22 regional juries. Carlos Paião previously took part in the 1980 Portuguese Semi-Finals. At the ESC he came equal 18th. 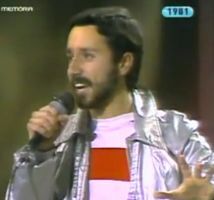 Amongst his backing singers was Ana Bola who represented Portugal in ESC 1977 (in the group 'Os Amigos'). José Cid represented Portugal in ESC 1980. Two members of the group Doce (Teresa Miguel & Fatima Padinha) were in the group Gemini that represented Portugal in ESC 1978.